At Versailles, facade is everything in Leconte's 'Ridicule'. 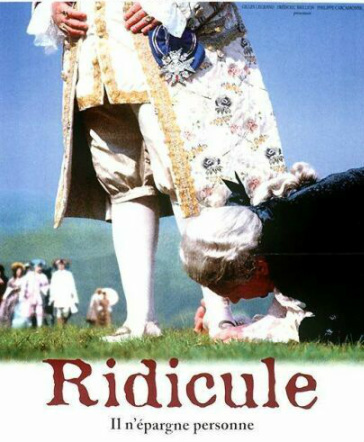 Although 'Ridicule' is set in the Versailles court of Louis XVI and Marie Antoinette, the King plays only a small role in the movie, and Marie Antoinette is glimpsed only at a distance. Yet this brilliant film exposes the pretensions and hypocrisy of the monarchy and the French aristocracy more succinctly, subtly and effectively than either the 1938 'Marie Antoinette' or Sofia Coppola's more recent version. The film is historical drama at its best, combining historical accuracy and insight with a compelling love story and intriguing characters. The film's clever plot focuses on Ponceludon, a minor aristocrat from the provinces, who is a resourceful scientist hoping to drain the region's mosquito-infested swamps in order tro ensure better health for the local peasants. This humanitarian project requires money which can only be obtained from King Louis XVI. But Ponceludon's decency and provincialism do not suit him for the intrigues of court, so he is tutored by a physician, Bellegarde, another minor noble (who has a beautiful, intelligent, scientifically-minded daughter) in the arts of ridicule and repartée needed to gain attention at Versailles. In order to get the King's endorsement of his swamp-draining project, Ponceludon is forced to engage in the vicious rivalries - sexual, political and financial - that contaminates the court. Ridicule succeeds on many levels. It is witty and at times blackly humorous. The main characters are distinctive, interesting and unpredictable, and the two female leads are both presented as forceful and intelligent women. The portrayal of the King as an essentially decent wanting to do well by his subjects but unable to overcome the social conventions of his own court seems to be historically accurate. The fatal moral decay of that court is cleverly conveyed not by lingering on details of the extravagant lifestyle but by showing through speech and deed its lack of empathy and generosity. And the ending is a real cliffhanger. Director Patrice Laconte on set of 'Ridicule'. 'Ridicule' may be Patrice Leconte's best-known film outside of France. 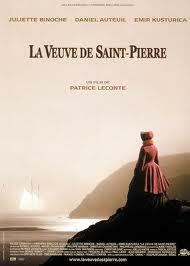 It won the French equivalent of Oscars for best film, screenplay, cinematography, sound and art direction. Leconte's film career is remarkable for the disparate subject matter of his movies. They range from historical dramas like Ridicule and The Widow of St. Pierre to farcical comedies, such as My Best Friend, Hitchcockian thrillers like Monsieur Hire, and Tango, along with romantic dramas such as Le Parfum d'Yvonne and dramas about friendship and identity ( Man on a Train). Born in Paris in 1947, Leconte was fascinated by film-making from childhood. He attended the famous film school I.D.H.E.C. but for several years was employed as a magazine cartoonist, while making short comic films on the side. His first feature film, Les Veces etaient fermes d' l'interieur,(1975) was a comedy. Since then his output has varied between box-office comedies and romances, and art-house movies. 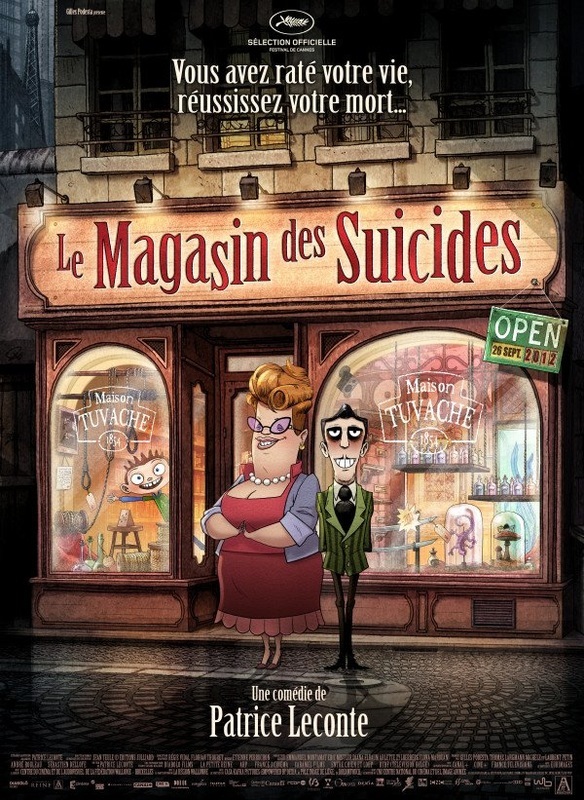 His latest movie, 2012's The Suicide Shop (Le magasin des suicides) is both a change of style and a return to his origins - it's an animated black comedy with music. 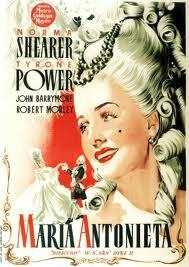 Leconte's most recent film. 'The Suicide Shop', is an animated black comedy. Costume dramas are a staple in this director's cinematic output. One of Leconte's enduring interests is the theme of identity and its social and personal consequences. 'Man on a Train' is one of his most successful investigations of this topic. 'Monsieur Hire' is a taut Hitchcockian thriller that examines the nature of guilt and identity. Louis XVI was indecisive, lacked political astuteness, and was deficient to having sufficient nerve and will to overcome the inertia and corruption that were rapidly eroding the authority of his government.. But he was not a stupid man. The pivotal plot point of Ridicule - its hero, the provincial engineer nobleman Ponceludon, goes to Versailles because he knows the King is interested in practical science - is historically accurate. So too is the movie's depiction of the two main female characters, Mathilde de Bellegarde, an intelligent young woman with a deep interest in experimental science (and whom Ponceludon gradually comes to love), and Madame de Blayac, recently widowed, experienced in the intriguies of court politics. Women did play a crucial role in the internecine politics of the court, and some were prominent in French scientific and intellectual circles. Indeed, science and philosophy ocupied a central place in 18th century French cultural life, a key feature of the intellectual revolution now known as the Enlightenment, and many aristocrats participated in this movement. Ridicule is one of the few movies to acknowledge this situation. During the period known as the Enlightenment, several French monarchs used their influence and wealth to encourage the work of scientists. 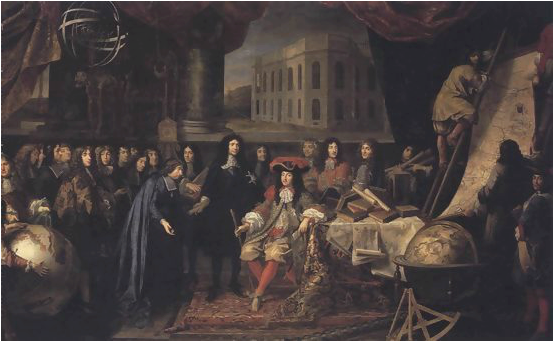 Thos painting by Henri Tes shows members of the Royal Academy of Sciences being presented to Louis XIV at Versailles in 1667. Louis XVI continued this tradition. Both Louis XVI grandfather Louis XVI used Versailles for scientists and inventors to demonstrate their discoveries and inventions. An invitation like this meant enormous status and possible funding. This is why the hero of ' Ridicule' wants a royal audience to explain his scheme for draining swamps. This painting, shows a 1846 electrical experiment in which the royal children's science teacher, Abbe Nollet, made 180 royal guards hold hands so Nollet could show that his 'electricity machine' at front could send an electric current through them all, no doubt to the delight of the youngsters. The tympanum. As the picture on the right shows, the flowing dress of the female automaton disguises the elaborate mechanism. During the eighteenth century there was a sustained interest in such devices, an interest shared by both Louis and Marie. Marie Antoinette is not usually associated with scientific inventions or robotics. Yet it is thanks to her that this remarkable early android / robot / automaton, shown on recent display at Versailles, has been preserved for posterity. This device was a tympanum, designed by two Germans -clockmaker Peter Kintzing and joiner David Roentgen. 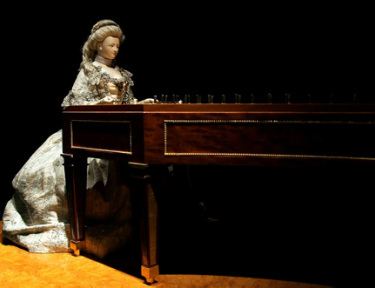 It played eight tunes when the female android - supposedly resembling the Queen - 'played' its 46 strings with two small hammers. They sent it to Versailles in 1794 and Marie bought it, eventually giving it to the French Academy of Sciences. Two drawings depicting the famous ballon flight at Versailles. The one on right accurately shows a wicker basket tied to the balloon; illustration at left fancifully displays an enormous cage and a very small balloon. The size of the crowd at right is greatly exaggerated. On 19 September, 1783, one of the most significant -and public - of all scientific experiments occurred at Versailles in front of the King and the royal family. The Montgolfier brothers had been invited by the Royal Academy of Sciences to demonstrate their invention of a flying balloon. At eleven minutes past one on the forecourt at Versailles, a balloon carrying a wicker basket containing a duck, a rooster and a sheep lifted off, rose to about 500 meters and flew for almost ten minutes, landing 3.5 kilometres away with its live cargo intact. History's first aeronauts were rewarded by being given homes in the royal menagerie.On 21 November the Mongolfiers repeated the experiment in front of the Dauphin at a nearby chateau.This time it carried a human cargo - PIlatre de Rozier, who became the first human to fly. The use of Versailles and the presence of the royal family for the September experiment, and the Dauphin's presence in November, shows the important part that the palace and the royal family played as sponsors / supporters of eighteenth century science. Judith Godreche as Mathilde de Bellegarde, a woman of the Enlightenment in 'Ridicule'. 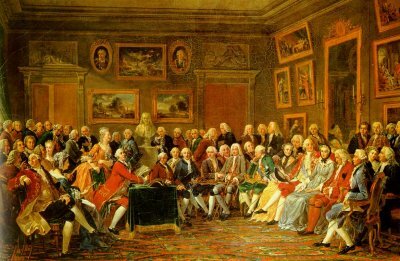 An 18th Century soiree discussing some scientific / philosophical issue. Note the presence of some women. Fanny Ardant as Madame de Blayac, skilled in the vicious art of infighting at the royal court. The two female antagonists of Ridicule both defy the conventional image of 18th Century women as passive,apolitical and unintellectual. Madame de Blayac (Fanny Ardant) is shallow, but rich, beautiful, witty, and recently widowed. She is an astute player in the amoral competitions for status, power and wealth at Versailles, both using and being used by her lover the Abbé de Villecourt. She gradually comes to respect Ponceludon's integrity and humanitarianism, yet is jealous of his attachment to Mathilde de Bellegarde, daughter of a physician who is a minor noble and who assists Ponceludon in his campaign to gain the King's sponsorship. Mathilde is fascinated by science; her latest experiment involves inventing a diving suit to obtain samples from ponds. The film presents her as scornful of the restrictions and hypocrisies that women face and determined to subvert them. Again, Ridicule is historically accurate. During the 18th Century women did play an increasing role in science, although they remained largely excluded from universities and the professions. The wife of the famed French scientist Antoine Lavoisier worked with him in his experiments, wrote them up and drew illustrations for his publications. England's Caroline Herschel published her discovery of new comets in the very year that the French revolution began. Three years earlier In Russia, Yeketerina Dashkova was appointed as director of the Russian Imperial Academy of Sciences in 1783. And in the French courts women had always played an influential role in influencing the policies and appointments of their lovers, husbands and male offspring.